Did you know your used iPhone 6 can feed 100 refugees? This Earth Day, reduce your e-waste and save lives in the process. Dubai-based startup Melltoo, no-melltoo classifieds, has partnered with local startups Fetchr, Washmen and The Box to collect your used electronics for free. The devices will be reset, data wiped and sold for charity. Funds will go to Salma Aid, a Sheikh Mohammed bin Rashid initiative that provides food relief for victims of humanitarian crises. As consumer electronics become indispensable tools in everyday lives, e-waste is a rapidly escalating problem. More than 45 million tons of e-waste are produced globally every year, the equivalent of 100 Burj Khalifa towers. The global average is 6.1 kg per person of e-waste a year. Compare that to the UAE average of 13.6kg of e-waste per resident in the Emirates. 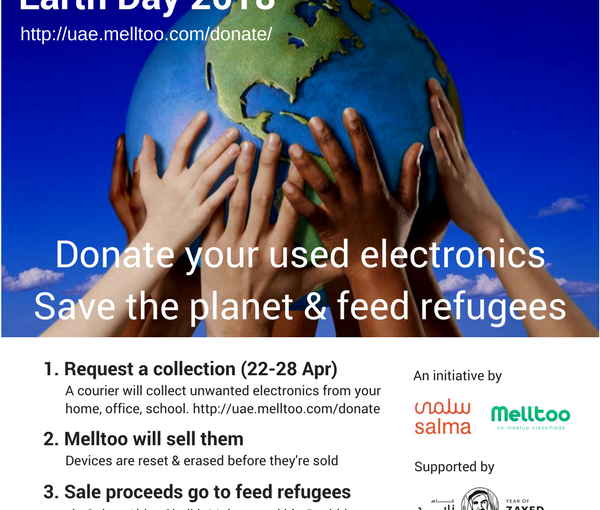 While there are several initiatives to recycle e-waste in the UAE, Melltoo takes it one step further. The startup first attempts to sell devices that are in reasonable condition then recycles what cannot be sold through their partners. Sale proceeds go to support Salma Aid, a Sheikh Mohammed bin Rashid initiative that provides food relief for victims of humanitarian crises. On the occasion of Earth Day, the startup has partnered with Washmen, Fetchr and The Box to collect used electronics from UAE residents. For the week of Earth Day, from 22 – 28 April, they will collect consumer electronics like mobile phones and devices, laptops and computers, accessories, TVs, game consoles and the like. Customers of Washmen, an on-demand laundry service, can add a box of unwanted electronics along with their laundry pickup. Washmen collects everything and delivers them to The Box, a self-storage facility in Al Quoz that has donated storage space to store the electronics while they are being prepped for sale. In addition, Fetchr, a last-mile logistics company, will also do home pickups of used electronics for free. Melltoo, along with a team of student volunteers will clean and reset all devices and list them for sale. “We are grateful to our partners, The Box, Washmen, Fetchr and our student volunteers for their generosity in supporting this Earth Day #Declutter4aCause initiative, in line with the Year of Zayed. The problems of e-waste and the refugee crisis are not problems that one entity or person can solve alone. It is through working together and getting everyone involved that we can really make a difference.” said Morrad Irsane of Melltoo. So, don’t wait. This Earth Day, declutter your unwanted electronics, free up some space in your overflowing closets, save the planet and help people. Thought this was interesting? Share it! Previous Previous post: Melltoo Impacter partners with Friends of Cancer Patients.